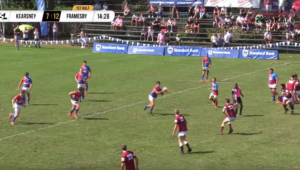 CPUT snatched victory in the 79th minute when scrumhalf George-Lee Erasmus burst away to score a try. 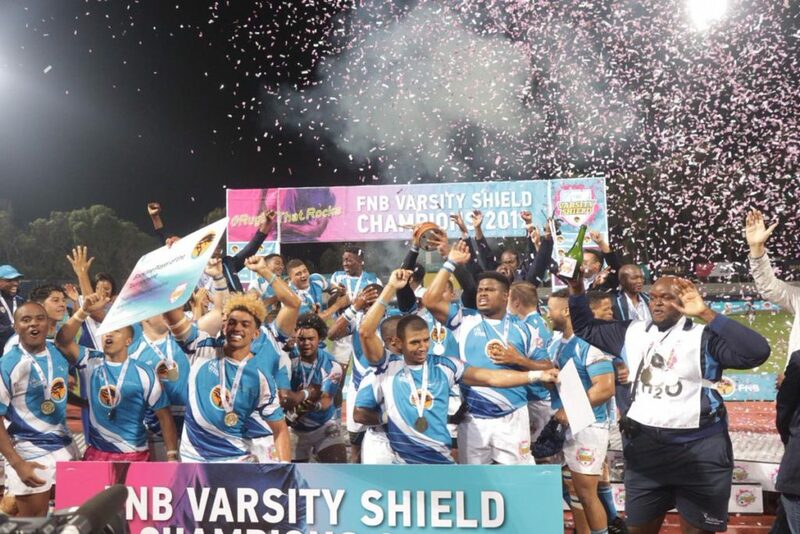 The Madibaz, who had topped the Shield log with six wins out of six, had led the final until that point. 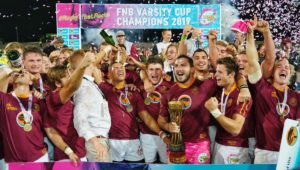 CPUT flyhalf Ralton October, who kicked three conversions and two penalties in the final, was named the Player of the Tournament. It literally went down to the wire! 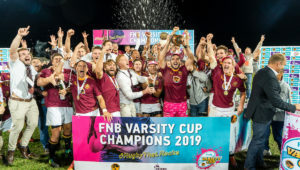 Final min of the #FNBVarsityShield final and George Lee Erasmus scores the winning try for @CPUT to be crowned 2019 champions ??? 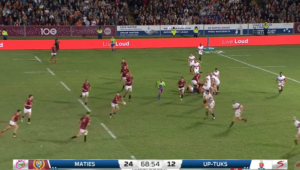 Madibaz – Tries: Stephanus Nieuwoudt (2), Johan van Wyk, Yomelela Kwesa. Conversions: Luvo Claassen. Penalties: Tristan Fourie (2). CPUT – Tries: Butsha Mputa, Colin April, Keadon Consul, George-Lee Erasmus. Conversions: Ralton October (3). Penalties: October (2). 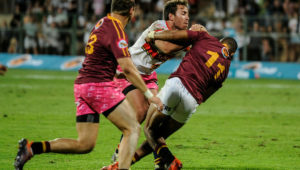 Madibaz – 15 Tristan Fourie, 14 Josiah Twum-Boafo, 13 Riaan Esterhuizen, 12 Christopher Hollis, 11 Yomelela Keswa, 10 Luvo Claassen, 9 Dundre Maritz, 8 Bevan Prinsloo, 7 Laken Gray, 6 Stephanus Nieuwoudt, 5 Ikhetheleng Nkhereanye, 4 Robert Izaks, 3 Johan van Wyk, 2 Thembekile Boltina, 1 Tembelihle Yase. Subs: 16 Ruan Jonker, 17 Keegan Branford, 18 Cameron Cato, 19 Dirk Ferreira, 20 Sibusiso Ngcokovane, 21 Jean-Pierre Greyling, 22 Njabulo Toni, 23 Bunganga Magwentshu. CPUT – 15 Randy Brinkhuis, 14 Christopher Andrews, 13 Lunathi Nxele, 12 Julrick Lewis, 11 Asisipho Malotana, 10 Ralton October, 9 George-Lee Erasmus, 8 Colin April, 7 Anenceba Salman, 6 Butsha Mputa, 5 Bradley Aiden van Boven, 4 Ameer Hendricks, 3 Jeandri Coetzee, 2 Keadon Consul, 1 Thembalihle Njadu. Subs: 16 Scarra Gqibithole, 17 Cecil Rittels, 18 Boris Hategekimana, 19 Xavier Myburgh, 20 Kevin Goddard, 21 Darren Alexander, 22 Deleo Kustoor, 23 Chadd Fortuin.